UNITED NATIONS, Jun 8 2018 (IPS) - Human rights issues must be included in next week’s United States-North Korea summit in order to create a “sustainable agreement”, said a UN expert. In an effort towards denuclearization, U.S. President Trump is set to meet North Korean leader Kim Jong Un in Singapore. In anticipation of the summit, UN Special Rapporteur on human rights in the Democratic People’s Republic of Korea (DPRK) Tomás Ojea Quintana called for human rights issues to be a topic of discussion. “At some point, whether [in] the next summit or other summits to come or meetings, it is very important that human rights are raised,” Quintana said. “I am not of the opinion that a human rights dialogue will undermine the opening and the talks on denuclearization at all,” he added. A 2014 UN report found systematic, gross human rights violations committed by the government including forced labor, enslavement, torture, and imprisonment. “My call is for an amnesty, a general amnesty that includes these prisoners, and it is a concrete call,” Quintana said. Approximately two in five North Koreans are undernourished and more than 70 percent of the population rely on food aid. Most North Koreans also lack access to basic services such as healthcare or sanitation. It wouldn’t be the first time that President Trump has taken a strong stance on North Korea. 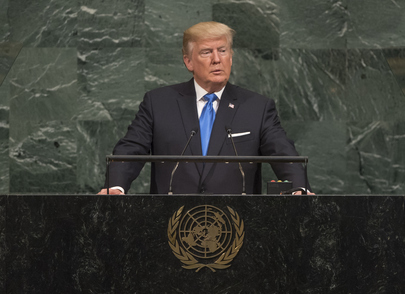 “No one has shown more contempt for other nations and for the wellbeing of their own people than the depraved regime in North Korea,” Trump said during his first speech to the General Assembly in 2017. “It is time for all nations to work together to isolate the Kim regime until it ceases its hostile behavior,” he added. In an open letter, more than 300 nongovernmental organizations (NGOs) from around the world have also called on North Korea to reform its regime and hope the upcoming meeting will urge human rights improvements as part of any agreement. “North Korea’s increased dialogue with other countries is a positive step, but before the world gets too excited they should remember that Kim Jong Un still presides over perhaps the most repressive system in the world,” said Human Rights Watch’s Asia Director Brad Adams. “As the UN Security Council has recognized, human rights abuses in North Korea and threats to international peace and security are intrinsically connected, so any security discussion needs to include human rights,” he continued. Human Rights Watch is among the human rights organizations that signed the letter. Among the letter’s calls to actions, organizations urged Kim Jong Un to act on UN human rights recommendations, increase engagement with the international human rights system, end abuses in detention and prisons, and to accept international humanitarian aid for needy communities. “If [Kim Jong Un] really wants to end North Korea’s international isolation, he should take strong and quick action to show the North Korean people and the world that he is committed to ending decades of rights abuses,” Adams said. Quintana echoed similar sentiments, noting that human rights issues were sidelined over two decades ago when the U.S. and the DPRK signed an agreement to freeze Pyongyang’s nuclear programme and again during recent six-party talks. “Those processes, although they were well-intentioned, were not successful,” he said. “For this new process to be successful, my humble opinion as a human rights rapporteur is that the human rights dialogue should be included because it is part of the discussion. Human rights and security and peace are interlinked, definitely, and this is the situation where we can prove that,” Quintana continued.